My Superjare Bed Table Review. 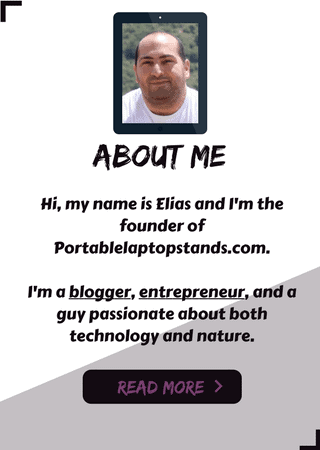 Superjare, unlike most laptops we reviewed on this website, is a one-size, one-height, big foldable laptop table. It’s super sturdy, big, comfortable, and can be used for really just about anything a normal table can offer. Food, reading and writing, fits all sizes of laptops, tablets, and Macs, and the Bamboo wood on its surface gives it a clean, nice, soft looking personality and touch. Read all 10+ customer reviews on Amazon here. 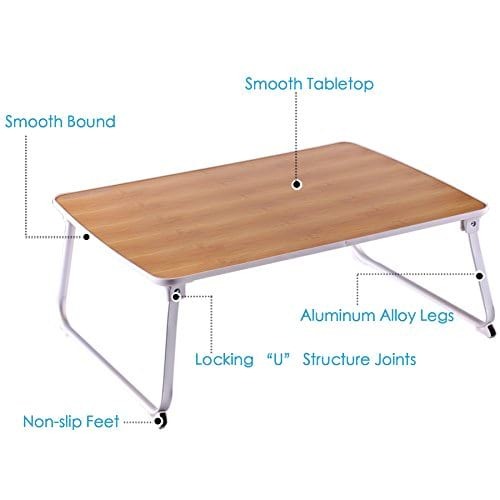 If you want a soft, clean looking, big and sturdy portable table around the house for all purposes, this Superjare table can provide that. I love big tables. I just do! Especially when they’re easily foldable, and portable. Like this one here. As you can see in the picture below, I estimate the laptop to be at least 13″ big, and it can already fit a lot more stuff on it very easily. 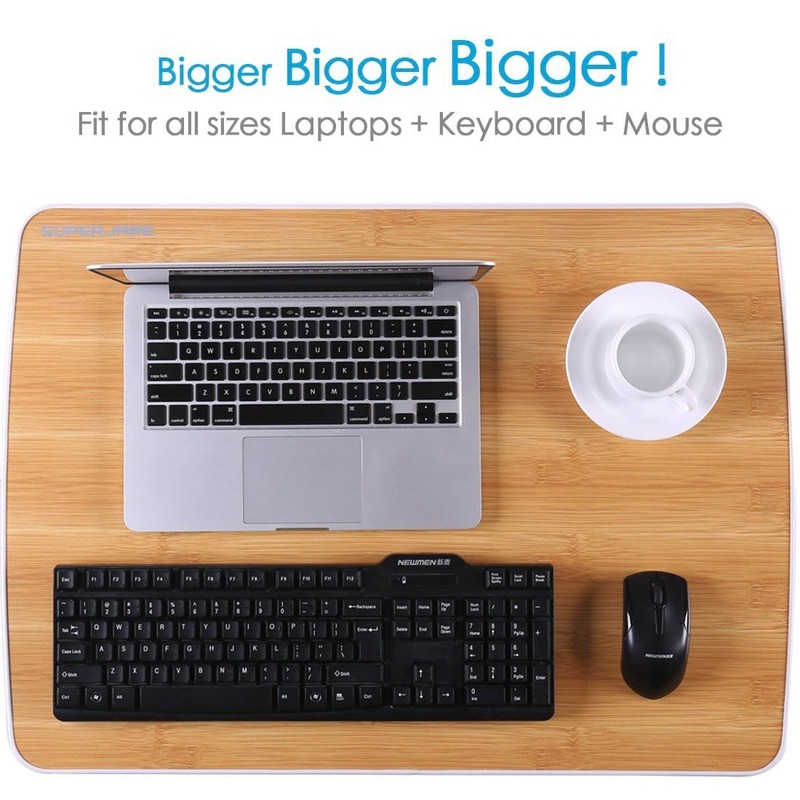 You’ve got a lot of space for all your peripheral devices such as the mouse, keyboard, and even small speakers if you’d love to, and it’ll still have some space left for your cup of coffee. Taking that with me to bed every night is a huge plus, since I love working on my laptop while in bed most of the times. I LOVE THE BAMBOO WOOD TOUCH. Most laptop stands are made of steel. Not this one. The surface is made of Bamboo wood grain that gives it a clean, soft touch, and the platinum aluminum legs give it the necessary support that such a big table demands. It’s foldable with “U” locking joints to secure the legs in place. 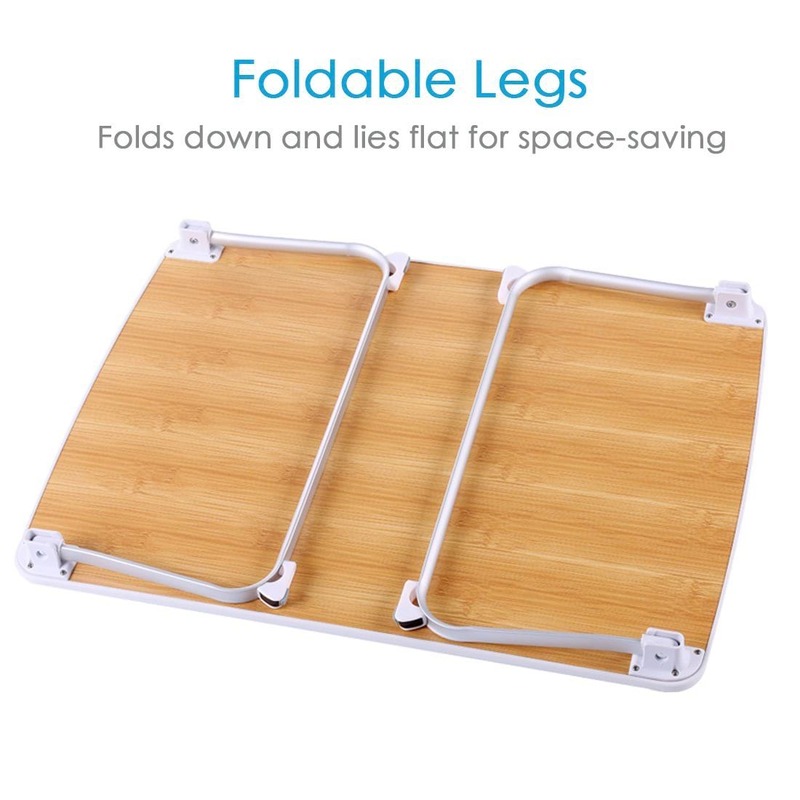 Easily and quickly fold or unfold the table whenever you need to, very convenient to use. 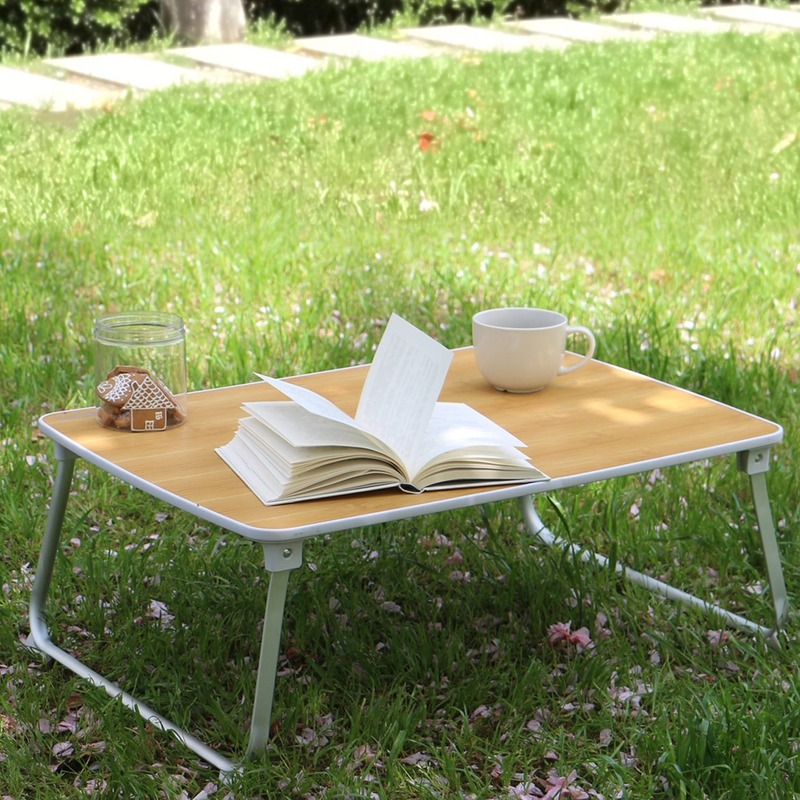 The feet have a non-slip grip that’ll keep the surface stable at all times, and the platinum aluminum alloy design of the legs give the stand a good amount of durability and sturdiness, and allows for up to 80 lbs of weight without any problems. Its bigger size allows for all kinds of purposes. You can eat on it comfortably, work on it, read or write on it, you can give it to your kids to do their homework or enjoy a coloring book on it, and if you have a baby in the house you can let him play with the toys on it. Just like any regular table would allow, but with added portability and versatility. BED TABLE, SOFA, COUCH, OR FLOOR TABLE. 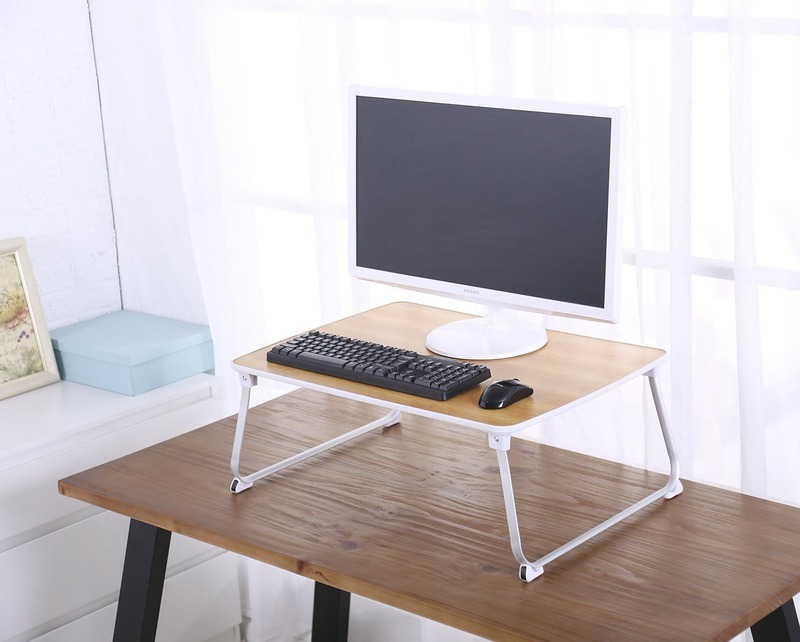 The design of this table allows you to bring your workstation with you to your favorite place. Do you enjoy working on your laptop on bed like myself? When you finish, simply unfold it and tuck it under the bed or to the sides. Do you like to work on the floor once in a while? The Superjare will easily allow it. You can work on the sofa … On the couch in the living room, in the garden outside, or you can place it on top of your current office desk at the office or home and work standing up, it’s a great way to increase blood circulation and relief your muscles from stiffness and long hours of working sitting in one position. 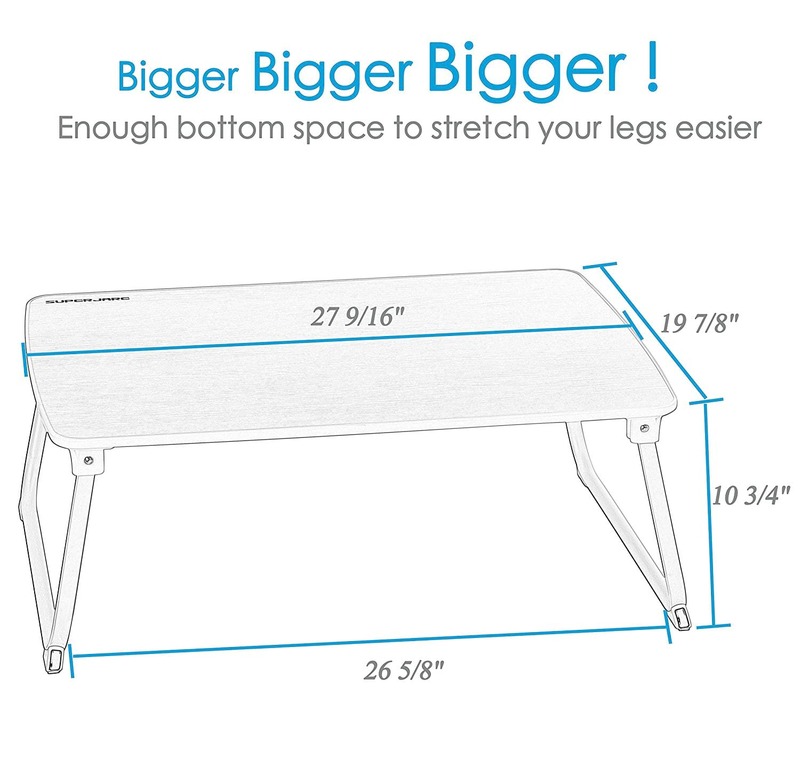 The Superjare is a big size, sturdy, stable, foldable and portable laptop table that will help you bring your precious workstation with you, anywhere you like. It’s sturdy enough to sustain and fit any size of laptops, tablets, MacBooks, and have all your peripheral devices on it without any problem. The surface is made of soft Bamboo Wood which gives it a great and a very comfortable touch and look, and has a little lip all around it to prevent stuff from falling down off the table and protects from scratches. 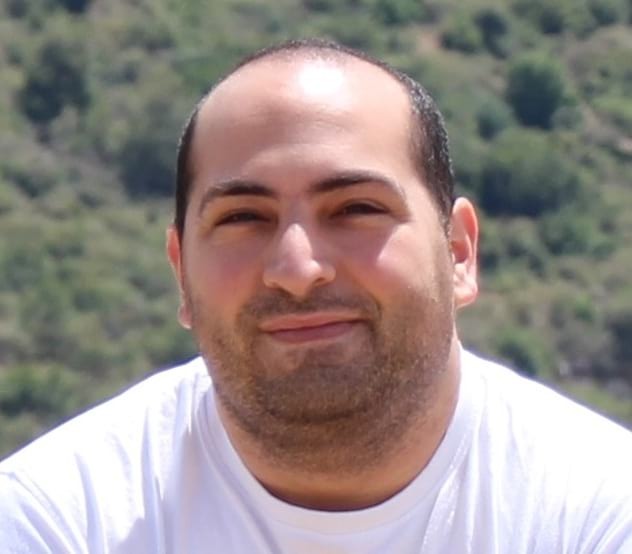 Occasions/Purpose: Home, Garden, Networking, Casual. Oh sorry to hear that, did you get it fixed? or contact the seller? things like these can happen and yeah a little bit of grooving won’t harm.